Fusion Antibodies CDRx platform has rapidly developed high quality humanized antibodies for Exeter based company Isca Diagnostics. The EU funded project will allow Isca Diagnostics to provide the healthcare profession with easy access to rapid and accurate diagnostic tests for human mycoses. We are excited to be working with Isca diagnostics on their Aspergillus antibody. 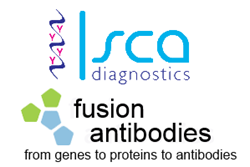 Fusion Antibodies Ltd have today announced a collaboration with UK medical diagnostics company Isca Diagnostics Ltd for development of their Aspergillus-specific monoclonal antibody JF5. The antibody engineering and humanization program partnered with Fusion Antibodies relates to a 5 year EU-funded project awarded to Isca and European partner organisations which will develop bespoke JF5-radiometal conjugates and PET/MR imaging technologies for diagnosis and therapy of human invasive pulmonary aspergillosis, a frequently fatal disease of immune deficient patients. The partnership with ISCA Diagnostics comes following a record breaking year for Fusion Antibodies’ Humanization service. "We are excited to be working with Isca diagnostics on their Aspergillus antibody and confident that Fusion Antibodies CDRx Humanization Platform will deliver high quality humanized antibodies that will accelerate the project into the clinic" says Dr Richard Buick, Chief Technical Officer of Fusion Antibodies. Isca Diagnostics is a University of Exeter spin-out company delivering point-of-care tests for the rapid detection of human fungal infections. The establishment of Isca Diagnostics has enabled the company director, Dr Christopher Thornton, to transfer University R&D activities to the medical sector, providing the healthcare profession with easy access to rapid and accurate diagnostic tests for human mycoses. The project is already underway and early data from the Humanized antibodies are expected in the New Year. Fusion Antibodies; a UK based life science company, with innovative technologies and world-class expert services for antibody drug discovery, are specialists in production of High Quality Humanized Monoclonal Antibodies and Antibody Engineering Projects. With 12+ years of experience in the medical research industry, including two Antibodies in clinical and pre-clinical trials, Fusion Antibodies have extensive experience in accelerating therapeutic drug research towards the clinic. Fusion Antibodies has the knowledge and expertise to build and deliver a bespoke package of the services you need to achieve outstanding results. They provide Royalty Free Antibody Humanization of Monoclonal Antibodies and using their next generation in silico CDRx™ technology, they have modernized the traditional CDR grafting technique. Fully humanized monoclonal antibodies are an essential step in the progression of therapeutic drugs to the clinic and the in-house expertise at Fusion Antibodies ensures its success. Visit their website at http://www.fusionantibodies.com to find out more.